Christianity is no ordinary religion. It’s the true religion. Though many of our neighbors are “choosing” their religion, they fail to realize that these choices bring them no closer to the true God or eternal life. Being a member of the Christian Church is not like joining a club. No, it’s much better than that. First, nobody can just decide to join the Christian Church. Membership comes from the Holy Spirit alone, who works this miracle through the message of the Gospel and through Baptism. Second, a club imposes obligations upon its members, like dues or participation in club events. Membership in the Christian Church is far too costly for any of us to afford. Our dues were paid forever by the blood of God’s Son. The benefits of a club are quite temporary, but membership in the Christian Church grows into eternal life. The Christian Church is the collection of God’s saints in Christ “in which the Gospel in purely taught and the Sacraments are correctly administered” (*Augsburg Confession VII*). It’s world-wide, and spans Time from Adam to the End. Your local congregation is one expression of it. However, just because a congregation calls itself “Christian” does not mean it is. Read the quote again in the last paragraph. If the Gospel is *impurely* taught, or if the Sacraments are *incorrectly* administered, we can’t be 100% sure that the Christian Church is there. So please, if you have a criticism about the teaching of the Gospel or the administration of the Sacraments at your congregation, speak to your pastor ASAP. Beside the Holy Christian Church, we also call our local congregation a “church.” Like the Church, churches don’t charge any dues. Their benefits are also eternal, as long as they teach the pure Gospel and administer the Sacraments correctly. 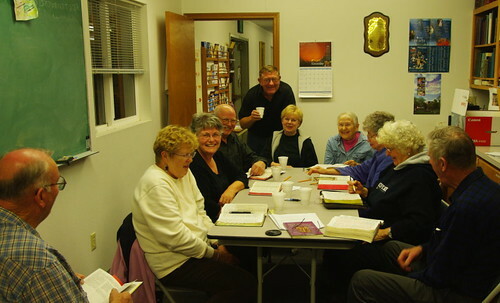 But unlike the Church, we can see who belongs to our local congregation, and we have operating expenses to keep the lights on, the doors open, the restrooms working, the lawn mowed, and — most importantly — the Gospel preached and taught from week to week, and the Sacraments administered. The Gospel and the Sacraments are a conduit provided by God that runs directly from Christ crucified almost 2,000 years ago to the person who hears the Gospel or receives the Sacraments. It’s how we receive forgiveness of sins, spiritual rebirth, faith, and eternal life. It’s how the Holy Spirit blesses us. We need it daily. December is when we think about the next year’s church budget. You might do this in your family, too. I’d like you to remember a few things this December. First, remember the priceless gift of God’s Son, and what a difference He has made in your existence. Second, remember that our church budget is an opportunity for each of us to return thanks to God, because it’s mainly our tithes and thank-offerings that make it work. Third, remember to consider the church budget responsibly, with God’s priorities and the world economy in mind. Fourth, remember the example of saints like Abraham (Gen. 14:20) and Jacob (Gen. 28:22), who dedicated a set percentage of God’s blessings back to Him, and were blessed through it. Fifth, remember that God has provided all our blessings, and will always give us far more than we can give in return (Mal. 3:10). In this economy when many 401(k)s have become 201(k)s, God challenges us to remember Him from whom all blessings flow. Our money reads, “In God We Trust.” Our actions usually speak louder than words. I invite you to prepare for Christmas in the thankfulness that God has chosen you to be His own, brought you into His Church, and continues to provide you with the food of eternal life. What could be better than that? After opening devotion, we had a few ideas to consider for future activities at LFF. Kirk provided quite a few, and Pastor said that anyone who would like to have a particular activity some night will have to bring any extra equipment and supplies we might need. For example: ingredients for cooking. If you’d like others to plan an activity with you ahead of time, just get it into the Sunday announcements the week of LFF. 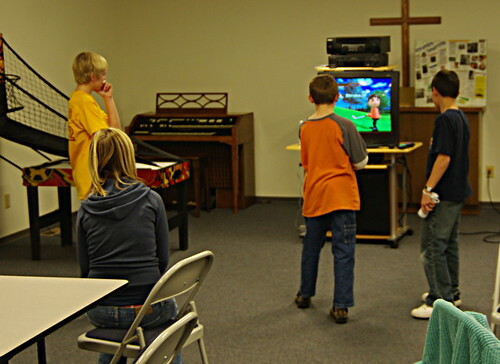 This week, we had a nice group come for a book club discussion, and our first night with the new [Wii game systems][wii]. Did people seem to like the Wiis? As they say in France: Wii Wii!